This excursion takes you to visit a selection of the numerous attractions in NhaTrang City . First the car will drive you to Cau Da for a visit the Vietnam Oceanographic Institute: built in 1922 to study the diverse marine life in this area. After that, you will go to Long Son Pagoda which was founded in the late 19th Century. The entrance and roofs are decorated with mosaic dragons made of glass and ceramic tile. From the pagoda, those more energetic will have the chance to climb the 152 stone steps leading to the giant white Buddha seated on a lotus blossom. There are superb views of the whole city from the platforms around the Buddha (14 metres high), which was built in 1963. Chong Promontory: means the “Husband Rock”, the name given to one of the two rocks (Husband and Wife). As a bridge to help them meet, a row of smaller rocks, stones, pebbles and corals pave the way for their reunion, this ill-fated legendary couple. 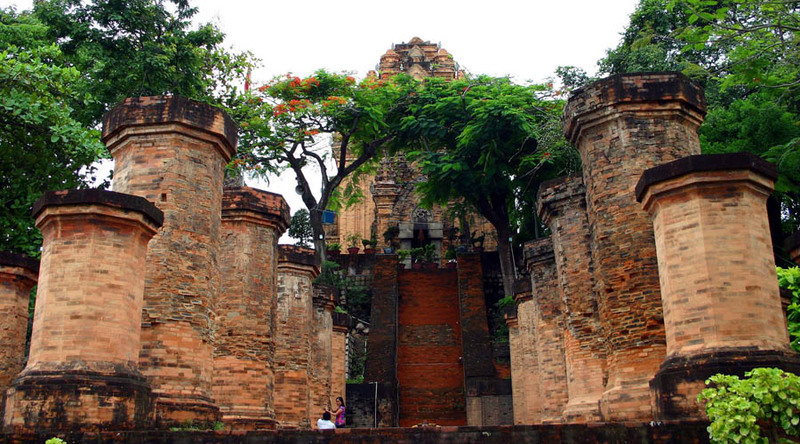 Evidence of the ancient Cham civilisation of Vietnam can be seen in Nha Trang at the hill top Po Nagar Cham Towers. Built between the 7th and 12th Century and named in honour of the former Cham Princess who introduced her people to profitable weaving and wet rice cultivation techniques, it is still used as a centre for worship today. Walk across Ha Ra Bridge below to photograph the abundant fishing boats moored in the shallow Nha Trang harbour. Boats are brightly painted in blue and red – an engaging sight against a typically azure sky . The tour ends for this morning is to visit to local Dam Market one of Vietnams ‘ most interesting local markets. There’s a colourful selection of local produce. Fruit, vegetables and seafood are the most common but you will also see dried seahorses and lizards – popular specialities of Nha Trang. After having lunch at a good Local Restaurant, then you relax yourself and soak in the mud at the Hot Spring Center. The van will transfer you back to your hotel through Nha Trang Street to observe local Nha Trang life.